A chakra is an energy centre that connects to, and surrounds the physical body. There are seven major chakras and a number of minor ones such as the foot, thymus, nasal and navel for example. We will be concentrating on the seven major chakras in this website. The chakras are not physical in nature but they affect your physical body. They affect all other parts of your life, including emotional, mental and spiritual well-being. The chakra system of balancing the chakras has its origins, over four thousand years ago, with deep connections to Hinduism. The word chakra is a Sanskrit word meaning wheel. The chakras are the means through which universal life force energy is translated into your personal energy. The energy within the body is the chakra while the energy around you is called the aura. Traditionally the colour assignments are red for the first, orange for the second, Yellow for the third, Green for the fourth, Blue for the fifth, Indigo for the Sixth and Purple for the Seventh chakra. Chakras are the primary mediators of all energy coming into and radiating our from the body. They mediate the impulses of our energy system. Although not part of the physical body, they link the subtle energy fields surrounding the body to the activities of the body itself. 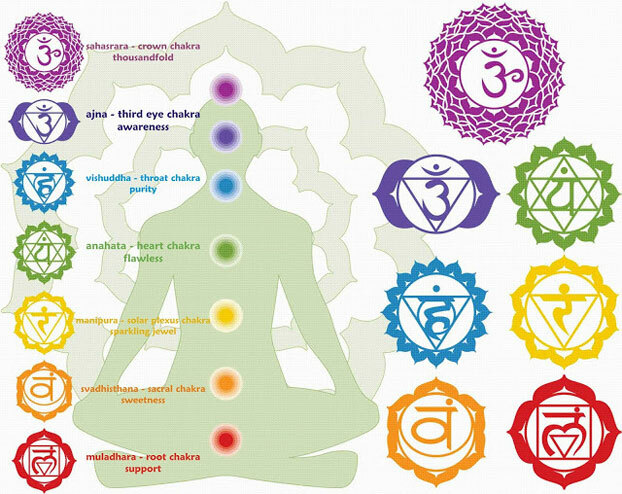 The chakras help the body distribute energy for its various physical, emotional , mental and spiritual functions. They are connected to the functions of the physical body primarily through the endocrine glands and spinal system. They mediate energy inside and outside of the body through the various spinal contacts. This energy is distributed throughout the body by means of the nerve pathways and the circulatory system. In this way, all of the organs, tissues and cells receive the vibrational energy accordingly. One of the most effective means of restoring balance is through the use of colour. Individual chakras and the related organs and systems in the body will respond to specific colours. If there is an imbalance, we can use colours to restore balance to the chakra and therefore to those systems and energies of the body mediated by the chakra. The colour vibrations interact with the electromagnetic emanations of the body. They are transmitted to the vertebrae of the spine. The vertebrae transfers the colour frequencies along the nerve pathways to the organs and systems of the body, restoring balance. This applies also to those emotional and mental imbalances that can cause or aggravate the physical problems. An under active chakra is usually one in which energy is congested. In a congested chakra, the energy does not flow freely through the chakra and its physical systems. An over-active chakra is one in which over stimulation is occurring. Too much energy is being drawn in and out of this centre, aggravating a condition. An under-active chakra can be treated with a strong dose of its basic crystal colour. An over active chakra can be treated by using its opposite crystal colour with a little of its basic colour as well. The Root or Base Chakra is located at the base of the spine. This chakra helps you with your awareness of self and your place in the world. It has lately been attributed to monetary and career success. It can also be used to enhance your emotional and physical well-being. The crystals for this chakra are RED, BLACK, BROWN, SILVER. The Sacral or Sexual Chakra is located on the lower abdomen between the naval and the pubic bone. This chakra helps in developing and enhancing your emotions and attachments. The Crystals for this chakra are ORANGE, PEACH. The Solar Plexus Chakra is located mid way between the base of the rib cage and the belly button. This Chakra helps you to mould your life in an effective way. It is associated with self worth, self confidence, spontaneity, laughter and Joy. The Heart Chakra is located in the centre of the chest between the pectoral muscles. This chakra helps you love and care for yourself and others. This chakra helps you with compassion, increases loving relationships with family and friends, and helps with decision making. The Third Eye or Intuitive Chakra is located in the centre of the forehead. This chakra helps you to see both on the physical and spiritual planes. It has been known to help you with your dreams, intuition, memory, concentration and enhance your psychic abilities. The Crown Chakra is located at the top of the head. This chakra helps you to connect with your inner spirit and the divine, it helps you to increase your awareness of the world around you.